TMPartners recently celebrated its 40th anniversary, marking that milestone with a move to a new office. Relocated a mile down Maryland Way, the new space is in the Hill Center Brentwood mixed-use development adjacent to the Franklin Road corridor. 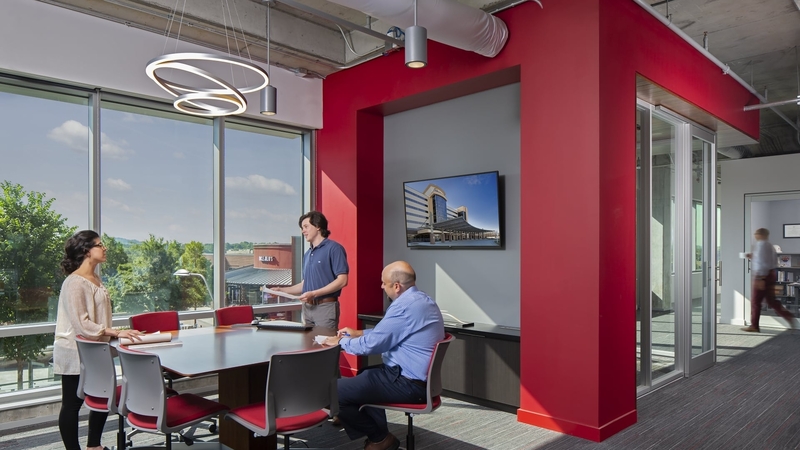 The design of TMP’s new office was a collaborative effort, with all members of the firm working in teams to develop ideas. Similar concepts found in multiple layouts were utilized by the final design team to create a new space that complemented TMP’s office culture. These concepts included an organization of spaces that flows from public to private, an increased number of group collaboration spaces, and exterior views and daylight as a shared amenity. An expanded break area created a space for gathering and social interaction between public meeting rooms. These rooms were designed as floating volumes within the office to create distance between the public corridor along the exterior and service spaces against the interior. This separation between public and service spaces allows employees to move efficiently through the office, utilizing different paths to move between areas. At the heart of TMP’s new office is a large open work space, designed to promote collaboration and encourage the frequent exchange of information and ideas that is central to TMPartners’ design philosophy.